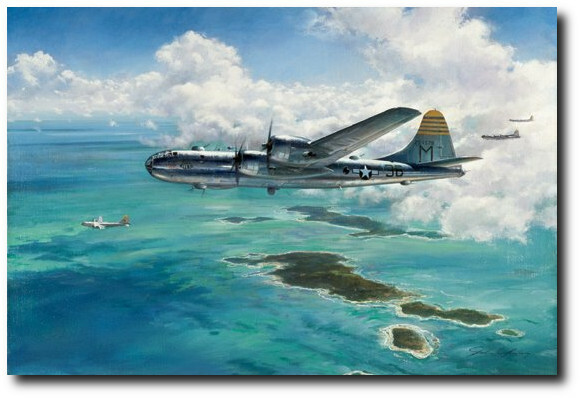 Paper Size: 26.75" x 20.5"
The Boeing B-29 "Eddie Allen" was far more than just another combat machine thrown into the effort to bring WWII to an end. Named after the famous Boeing test pilot Edmund T. "Eddie" Allen, the aircraft was paid for by donations from the employees of Boeing Wichita and given to the USAAF as a gift. Allen gave his life in the crash of the B-29 prototype, trying to nurse the burning aircraft back to base in order to analyze the source of the problem. The “Eddie Allen” served its country well, flying 24 combat missions before being so badly damaged that it was almost unable to return to its Tinian Island base. The damaged aircraft was never to fly again and its remains were left on the small Pacific Island.